The change of conditions was noticable across the fleets, but especially in the RS:X, although as the winners today had missed many of the earlier lightwind races, their scores had little effect on the overall leaders. 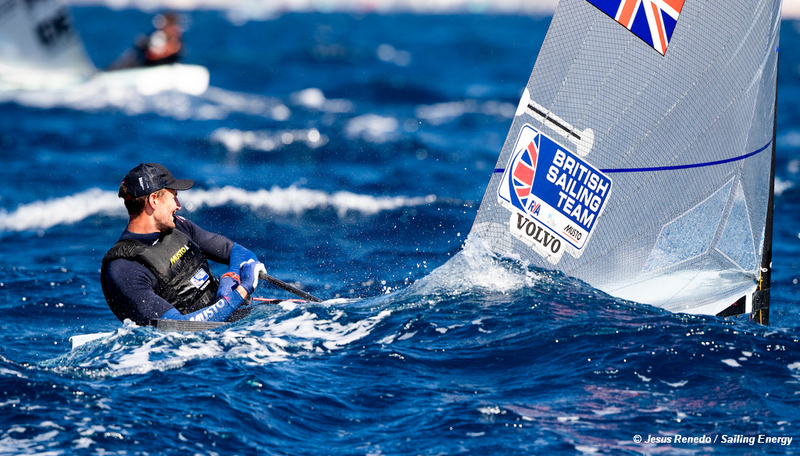 British Sailing Team (BST) member Bryony Shaw took the chance to rejoin the RS:X for a blast, taking a fourth and fifth place. Next week things get more serious for the RS:X sailors when they compete in their European Championships in Mallorca. In the Radial fleet Alison Young, in more suitable conditions finally gained some places, finishing the day in 14th place and with an outside chance of making the medal race. Overall leader Anne-Marie Rindom DEN did not sail the second race but retains a 19 point lead. Elsewhere British prospects were looking up with Ed Wright (1, 5) and Gile Scott (4, 2) enjoying the conditions in the Finn, and both now in the Top 10, although Andrew Maloney NZL keeps an 11 point lead. The 49er now has Fletcher and Bithell (10, 4, 1) eight points clear of the Lang brothers ARG, but in a tight fleet the Kiwi pair Burling and Tuke (7, 1, 3) had a better day to move into fifth overall. In the 470 events, Mills and McIntyre (5, 11) and Patience and Grube (5, 10) both hold second place in their respective fleets. Lecointre and Retronaz of France have a three point lead in the women and Sweden’s Dahlberg and Bergstrom 14 points in the men. The 49erFX remains a bright spot for the British Sailing Team with close competition for the Olympic GB Team place. Weguelin and Ainsworth (10, 13, 2) finished ahead of Dobson and Tidey in all three races but only gained a place overall. Brazil’s Grael and Kunze take over the overall FX lead as Dobson and Tidey (13, 24, 8) slip to third place. In the Nacra17 Rupert White and Kirstie Urwin (8, 8, 6) moved up a gear in these conditions, mixing it with the two top BST crews. Gimson and Burnet (2, 12, 9) ended the day ten points behind Aussie leaders Waterhouse and Darmanin, with Saxton and Boniface (4, 7, 7) in fourth place. In the Laser class event Nick Thomson (1, 12) got back into the action with a win in race seven. There are now three BST competitors in the Top 10, where Chris Barnard of the USA leads from Ireland’s Finn Lynch and Britain’s Elliot Hanson (10, 6). Just one more day of qualification races on Friday which will confirm the Top 10 in each fleet to go forward to the Medal races on Saturday.